You Can Be a GC WELCA Fashionista! 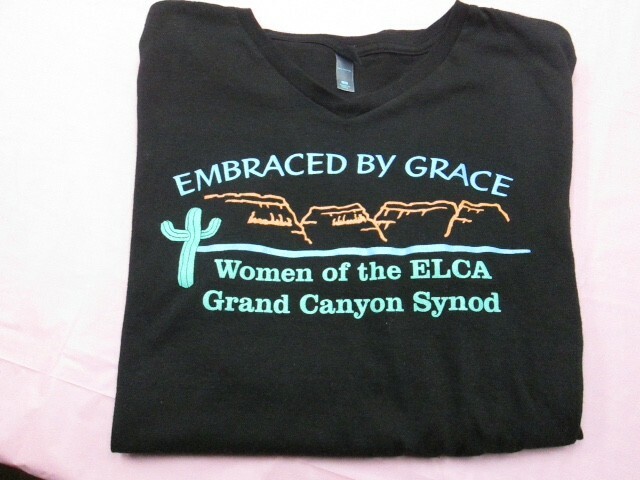 These beautiful t-shirts were unveiled at the WELCA Grand Canyon Synod Board meeting held at Streams in the Desert, Tucson awhile back, and are now available for $15 when purchased at our Synod events. You can now order them online (below) or order by mail and pay by check through our President (email your request to president@grandcanyonwomen.org). There is a $4.50 additional charge for shipping/handling when purchasing online or by mail. With ‘Embraced by Grace’ being the theme, the shirts were designed to highlight the beautiful mountain scenery of the Grand Canyon, the blue waters of the Colorado River and the native saguaro, found only in the Sonoran desert. The light weight, pre-shrunk cotton (great for summer), with a V-neck (making one look taller), and black background (making one look thinner) is the perfect addition to your wardrobe. As a Lutheran (often referred to as ‘The Chosen Frozen’), wearing the shirt will give you the perfect opportunity to talk about and share your experiences as a WELCA Fashionista. The shirts have also been known to enhance your enthusiasm for the faith and grace in your own life! All this for a very reasonable price of $15.00 (S, M, L,XL or XXL). Proceeds benefit our convention scholarships. Linda Post-Bushkofsky, Executive Director of Women of the ELCA, gives our “Fashionista” t-shirt a thumbs up!